If I had to rate the Henry H. Holmes sections I would give it 5 stars, the same for the Daniel Hudson Burnham sections. Together though, this is a solid four star book. I think trying to mesh Holmes and Burnham together doesn't really work in the end. Probably because we follow Holmes after the Fair and we see what he got up to. I wish that Larson had provided more details, it seemed fairly short in the end. We just hear how Holmes was encased in cement, his grave missing. Burnham died after learning of a friend dying on the Titanic. Larson starts his tale with going into Burnham's life as he goes across the ocean and then jumps back to his beginning and how he and his former partner, John Root would oversee design and construction of the World's Columbian Exposition otherwise known as the Chicago World's Fair in 1893. Burnham seems plagued with bad luck while the other subject of this book seems to have the devil's own luck. 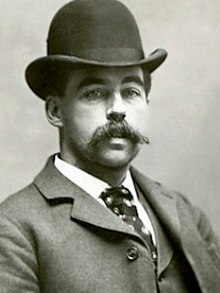 Henry H. Holmes was a serial killer who took to Chicago quite easily. Larson traces how he came to Chicago and charmed a soon to be widow who then disappeared after their acquaintance. Holmes seemed to have an uncanny ability in attracting men and women alike. Married multiple times, he seemed to always be several steps ahead of the police, creditors, and others when they came looking for money or missing family members. Larson eventually loops in the man who will bring down Holmes, Frank Geyer's sections of the book were so engrossing. This is a man who hoped to track down missing children who were last seen with Holmes, never understanding that the man had something missing in him that many others had remarked about before. The writing was too clinical at times, though it's a nonfiction book, I would have liked to see more passion by the author. The flow was not great up front. I know a lot of reviewers got annoyed by the Burnham sections. They tended to get better at the halfway point once Larson included other real life people such as Buffalo Bill, Annie Oakley, and many others. I think if he had split this book into two it would have many people exclaiming how good it was. The setting of the book is Chicago and Larson does his best to set a stage of Chicago in the late 1800s. You could practically smell the stench while reading. Larson includes fires, strikes, and many other things that occurred in Chicago at the same time as Holmes and his infamy. The ending needed a bit more oomph in my opinion. We hear about Holmes end, but I wanted to know more. Considered America's first serial killer, I wanted to know more about Holmes poor victims and what happened to the families after his death. Burnham we find died in Germany in 1912, sixteen years after Holmes was sentenced to death.